I am going to be on a panel tomorrow night! With Dylan Horrocks, Adrian Kinnaird and Sam Orchard. If you live in Auckland you should come along – it’s free and you can check out all the comics in the exhibition too. It’s at 6pm at the St Paul St Gallery at 40 St Paul St in Auckland. If you do come along because you’ve read this (I know I’m probably dreaming) come up and say hi! 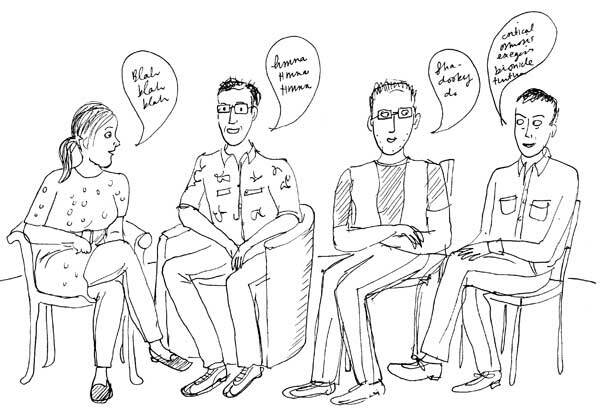 Here is a comic about a panel I was on a few years back but I’m not nearly so nervy now – I have been coerced into way more public speaking since then. ← The comic books and a comic!